This energy efficient LED from Maxlite consumes only 10 watts of power, but gives out 750 lumens for light output. 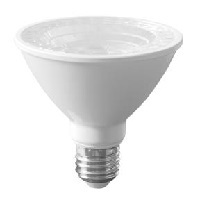 It allows the bulb to deliver the same quality of light as a 75-watt incandescent lamp. This item comes with a 5 year warranty and is energy star approved.